that was an awful game. now we'll have to suffer through another day at twickenham of dallaglio poncing about trying to look menacing and shouting his mouth off. a real shame for cipriani, hope he gets better soon. 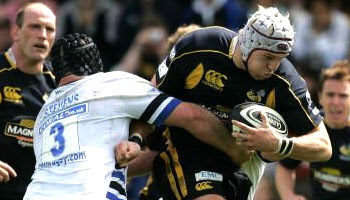 I'm a wasps fan, but i just hope the game doesn't become Dallaglios big day. Still he's a great player, despite being prone to a spot of poncing about trying to look menacing, he's delivered the goods on more then one occasion. Thanks for posting these RD, I've been struggling to watch the games having moved to France and it's brilliant that i can catch the highlights on here so soon afterwards. Dallaglio is abit of a shitpig tbh. On several occasions yesterday i saw him shoving people around trying to look tough, if he spent that time trying to bring something more industrial to the game he would be a far better player. I bloody hate this commentator, why does he have to say "quite" in every sentence!?!? Quite magnificent, quite brilliant, quite spectacular...shutup mun. Surprisingly in this clip he only says it once or twice, but if you watch a whole game he does your head in. Cipriani fractured and dislocated ankle! Oh yeh mick cos i forgot Dallaglio trys to look menacing.....in all honesty if that man was running at me i think his attempt at trying to look menacing would succeed. Because Geraint he is quite a classic commentator! Anybody who has this game recorded, watch it when the clock by the score reads 75:50 for a few seconds. Notice Butch James (white no.10) pull a Wasps player from the ruck/maul and strike him two or three times. All credit to the Wasps player (no.18) who makes to retaliate and then thinks better of it. Then watch when the clock reads 76:33 and try and spot White number 6 swinging his right arm wildly in a fairly "striking" fashion.